A landmark brace from Gonzalo Higuain secured a deserved victory for Juventus at struggling AC Milan on Saturday. 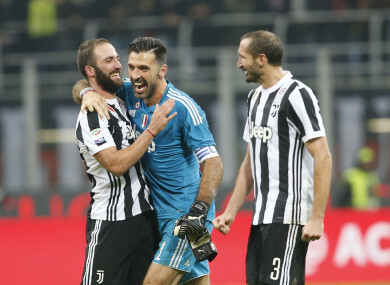 Gonzalo Higuain celebrates with Gianluigi Buffon and Giorgio Chiellini. GONZALO HIGUAIN SCORED his 100th Serie A goal as Juventus claimed a 2-0 win at San Siro to move joint-top with Napoli and ramp up the pressure on AC Milan boss Vincenzo Montella. The Argentine striker found the back of the net once in each half to take his league tally to 101 and consign Milan to a fourth consecutive home game in all competitions without a victory. If a miserable run at San Siro does not do for head coach Montella, it may be the Rossoneri’s poor record against top-six sides this season that costs him his job – Juve followed Lazio, Roma and Inter in making light work of big-spending Milan. While this was not a particularly poor Milan performance, they were listless in attack and their forwards’ failings were only emphasised by the presence of Higuain in the opposing ranks. The 29-year-old thrashed a ruthless effort into the net after 23 minutes and then doubled his tally shortly after the hour-mark with a similarly devastating strike, suggesting he is returning to his prolific best after a difficult start to the campaign. Milan could slip into the bottom half this weekend as a result, while reigning champions Juve moved level at the summit with Napoli, who host Sassuolo on Sunday. Clearly aware of the enormity of the fixture and their desperate need for a result, Milan started at a great pace at a baying San Siro. Gianluigi Buffon punched an early Ricardo Rodriguez free-kick away from his near post and Nikola Kalinic should have turned a shot on target amid a chaotic goalmouth scramble. But as the blood and thunder of the opening 10 minutes faded, Juve gained a foothold and the dangerous Paulo Dybala tested Gianluigi Donnarumma from range before Higuain broke the deadlock. Dybala fed a pass into his strike partner, who controlled instantly and snapped a finish inside the right-hand post for his landmark strike. The Bianconeri retreated into their shell, but Milan lacked the cutting edge to make the most of a dominant end to the first half and Kalinic passed up their biggest chance as he rattled the crossbar from close range. Milan’s momentum slowed again following a bright spell after the restart and they were grateful to twice see Dybala miscue in positions he has readily scored from in the past. But Higuain would not miss. Dybala dummied Kwadwo Asamoah’s pass to give the former Napoli man time and space to steady himself and fire home via the base of the post. Juve assumed complete control throughout the closing stages, with Higuain and Dybala continuing to combine but sparing Milan the humiliation of a third as Montella’s men crumbled again. Email “Higuain-inspired Juventus beat struggling Milan at San Siro”. Feedback on “Higuain-inspired Juventus beat struggling Milan at San Siro”.